There are so many crafts that you can make to celebrate Earth Day. It's a great time to look around your home and see what you've collected to repurpose into something new. I keep a decorative container filled with magazines in my bedroom. I love looking at them over and over to get inspiration and sometimes use in recycle/upcycle projects. I remember seeing a basket made of coiled magazine strips shaped into open squares that looked so different and unique. I filed that image away intending one day to create something like it. It has taken awhile to finally put the basket together. I actually started it last year, got discouraged, and put it away. A craft group that I belong to decided to do a blog hop on earth day crafts and I knew the magazine basket would be perfect for the event. Begin by making the magazine tubes that will be shaped into squares. Since this is an Earth Day project, I cut out only green & blue pattern magazine pages - green for grass, blue for sky. Cute, eh! Fold the page in half lengthwise, and then fold in half again. Cut along the folds into four even strips. Take a skewer stick and place it on the corner edge of the magazine at an angle. 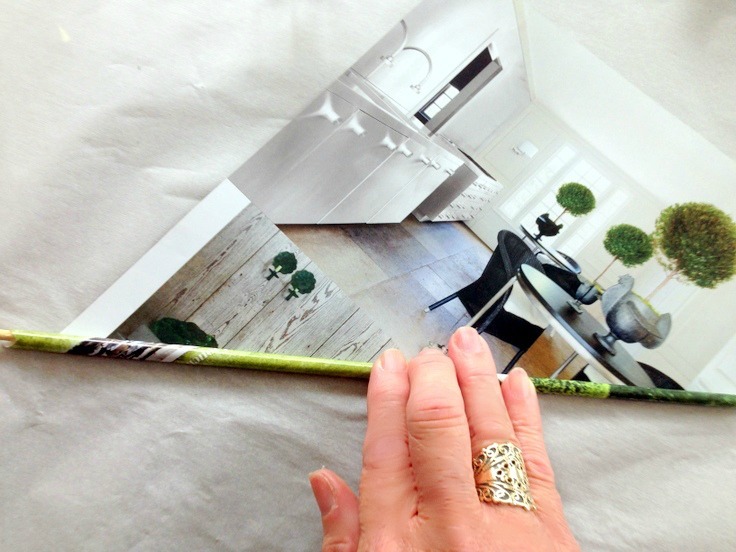 Take the end tip of the page over the skewer and start rolling the paper on the stick until you get near the end. You might have to lift the paper up to tighten the roll by twirling the stick. It takes a bit of practice to make tight tubes. Add white glue to the triangular edge and roll to the end. Flatten the finished tube. You will need to make lots and lots of tubes for this basket. Next, take a small square container (I used an empty salt shaker) and wrap a tube around it a few times. Connect additional tubes, if needed, by adding a little white glue on end and inserting into opening of wrapped tube. Seal end with hot glue. 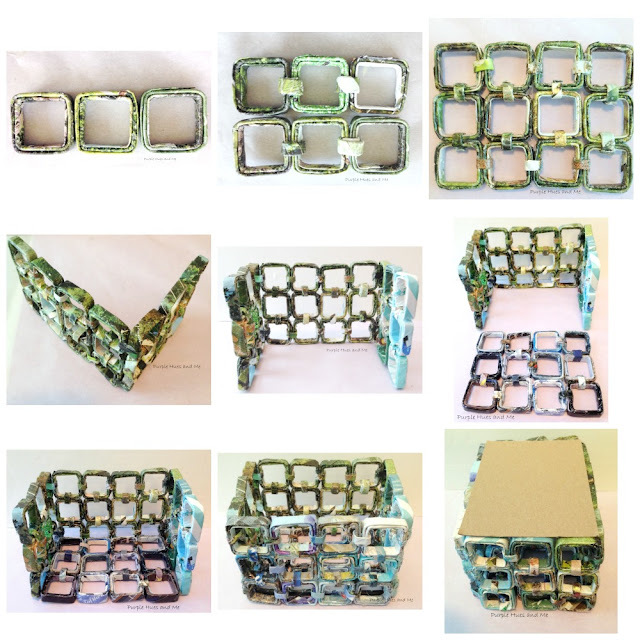 You will need 54 magazine paper squares to assemble this basket. To assemble, connect the squares in groups of three for each side. Apply hot glue along the connecting edges and press together. Then cut smaller strips of rods and wrap around the connecting sides and hot glue in place. For the shorter two sides, three rows of three squares were glued together and wrapped. For the longer sides, and bottom, four rows of three squares were glued together, wrapped. All corners were connected in the same manner to form the basket. Next, cardboard was measured and cut-out slightly smaller than the bottom of the basket, mod podge on both sides with magazine paper, and inserted inside the basket to prevent contents from falling out. And finally, five magazine tubes were woven together to make the handle. You can see a full tutorial on how to weave here. The ends of the handle were wrapped around the center square, hot glued together and secured with a piece of magazine tube and hot glue. The basket can be sealed with mod podge or gorilla wood glue that dries clear. 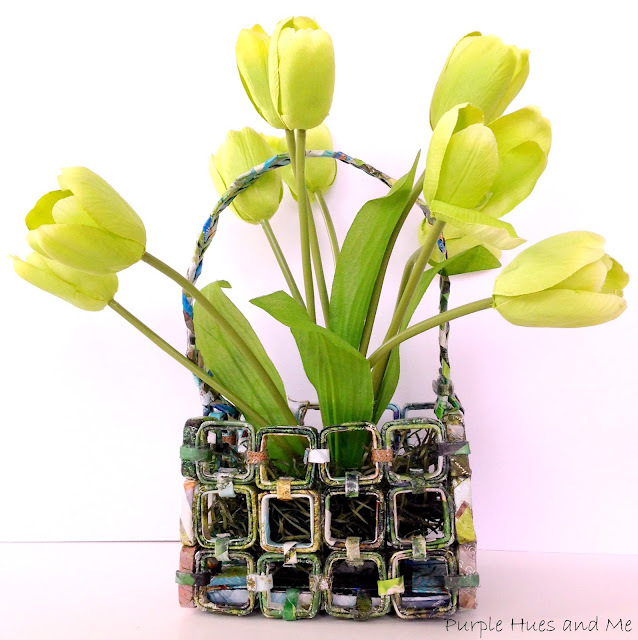 This handcrafted upcycled magazine basket is perfect for showing off a huge array of items, one of which are beautiful spring flowers. Join in and be sure to check out all of our Earth Day projects! Totally cool Gail! I love the little squares and how funky this magazine basket looks! I want you to know, I have been saving magazines because of all your fun paper crafts - I am so going to try some! This is such a great use of left over magazines Gail. And the end result is stunning. I can see why it took you so long to make, but it certainly is worth it. Happy Earth Day Gail, if any one should celebrate it is you. You make the most amazing things out of practically nothing. . So original and cute. Love that you celebrate Earth Day. Hope you enjoy earth day! This would be wonderful for Easter baskets as well. I'm not sure I'd be as patient as you to make it though. Gail, love your creative idea for Earth Day. You are so handy at re-purposing. Thanks for sharing at DI&DI. I love this craft for Earth Day. Cheers to a fantastic upcycle Gail. That is so modern looking. I love it! Wow...that is really awesome, and I know it had to have been a labor of love! What a neat way to use up old magazines! I've seen cool little bowls and things made out of magazine pages, and I marveled at all the tedious work that went into them. I don't think I'd have the patience! Love it!